Nielsen has released new music industry data today for the first six months of 2013. Although music sales fell, streaming music continues to rise, helping to stop some of the bleeding. Overall sales of albums and track equivalents were down 4.6 percent year-over-year to 210 million units while streams jumped 24 percent to 51 billion. For the six months ended June 30th, the most popular streamed track was Baauer's 'Harlem Shake,' streamed a massive 438 million times. 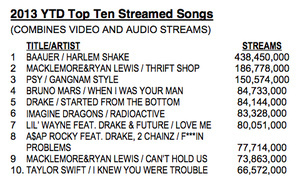 Macklemore's "Thrift Shop" was a distant second at 187 million streams. Digital sales continued to be strong, but the days of double digit growth in the market seem to be over. Digital album sales were up 6.3 percent to 60.8 million units, while CDs dropped another 14.2 percent to 78.2 million units. Single track downloads fell 2.3 percent to 682 million. "Overall sales are down slightly in the first half of 2013, but there continues to be encouraging growth in digital album sales," noted David Bakula, SVP Nielsen Entertainment.